This article is about the manga. For the TV anime, see JoJo's Bizarre Adventure (season 1). Battle Tendency (Japanese: 戦闘潮流, Hepburn: Sentō Chōryū) is the second story arc of the manga series JoJo's Bizarre Adventure written and illustrated by Hirohiko Araki. It was serialized in Weekly Shōnen Jump from 1987 to 1989 for 69 chapters, which were later collected into seven tankōbon volumes. The arc was preceded by Phantom Blood (1987) and followed by Stardust Crusaders (1989–1992). In 2012, Battle Tendency was digitally colored and released as digital downloads for smartphones and tablet computers. A four-volume hardcover re-release under the title JoJonium was published between February 4 and May 2, 2014. This version was licensed and released in North America by Viz Media; beginning digitally in March 2015 and in print in November 2015. In its original publication, it was referred to as JoJo's Bizarre Adventure Part 2 Joseph Joestar: His Proud Lineage. [a] Battle Tendency was adapted in the anime television adaptation by David Production between December 7, 2012 and April 5, 2013. Joseph Joestar is the grandson of Jonathan Joestar, having been raised by his grandmother Erina Joestar and told of his grandfather's death fifty years ago. In 1938, accompanying Erina to New York to visit his "uncle" Robert E. O. Speedwagon, now a wealthy oil tycoon, Joseph befriends a pickpocket named Smokey Brown. Joseph soon learns that Speedwagon was leading an expedition in Mexico when he was attacked by his former friend Straizo, who used the vampire-creating Stone Mask on himself. After Joseph defeats him, Straizo admits to Joseph that Speedwagon survived and is being held captive by a group of Nazi scientists under the command of Major Rudol von Stroheim, who are studying a being known as the "Pillar Man" that Speedwagon's expedition discovered. While he manages to save Speedwagon and defeat the Pillar Man, named Santana, with his wits and latent skills in Hamon, a dying Stroheim warns Joseph that the Germans have discovered three other Pillar Men in Rome who will awaken soon. Joseph and Speedwagon travel to Italy, where they meet up with a Hamon user named Caesar Zeppeli, the grandson of Jonathan's ally Will A. Zeppeli. However, the group arrive too late to prevent the resurrection of the Pillar Men Kars, Wamuu, and Esidisi, who have developed fighting styles to counter Hamon. Joseph plays on Wamuu's pride and convinces him to let him live to be a more worthy opponent. Both Wamuu and Esidisi implant poison-filled rings in him, giving him one month to get the antidotes from each of them. Caesar takes Joseph to Venice to meet his teacher and the last Hamon master on Earth, the mysterious Lisa Lisa. Lisa Lisa is the protector of a gemstone called the Red Stone of Aja,[b] which Kars seeks in order to evolve the Pillar Men into ultimate beings. Joseph trains under Lisa Lisa, saving her assistant Suzi Q from Esidisi and managing to destroy him. The group tracks down Kars and Wamuu to Switzerland and cross paths with Stroheim, who has been revived as a cyborg. Caesar tries to fight Wamuu one-on-one and manages to take the antidote for Joseph, at the cost of his life. Joseph and Lisa Lisa then confront Kars and Wamuu for the Red Stone. Although Joseph defeats Wamuu in battle, Kars acquires the Red Stone and uses it to become the Ultimate Being. Now immune to the sun and able to create Hamon, Kars' only desire is to kill Joseph. However, a Hamon strike toward the Red Stone causes a volcanic eruption that sends both of them flying into the sky. Kars is knocked by volcanic debris into space, where his body freezes to a sentient statue. Unable to die, he drifts throughout space for eternity and eventually ceased thought. Joseph is assumed to have died saving the world until he shows up at his own funeral, where he reveals his marriage to Suzi Q. The world is once again at peace until 1987, when an aged Joseph makes an emergency trip to visit his daughter in Japan, kicking off the events of Stardust Crusaders. Joseph Joestar[c] is the main protagonist and grandson of Jonathan Joestar. Like Jonathan, he can use Hamon, though he is not initially as skilled in its use as Jonathan was. He initially uses a pair of Hamon-empowered clackers in battle, but he relies more on his wits than brute strength in fights, employing his uncanny ability to predict his opponent's actions down to what they say. Joseph makes return appearances in Stardust Crusaders and Diamond Is Unbreakable. Caesar Anthonio Zeppeli[d] is a suave ladies' man and the grandson of Jonathan Joestar's Hamon teacher Will A. Zeppeli. He is rather cool and collected, especially compared to Joseph, with whom he is grudgingly paired to fight the Pillar Men. But over time, Joseph starts to grow on him so much that he is able to understand his strange thought patterns and they form an unbeatable duo. He infuses the Hamon into soap bubbles he creates with his specially-made gloves. Lisa Lisa[e] is a mysterious lady Hamon master and Caesar's Hamon teacher who lives in Venice. She is the last surviving master of the Hamon and she is revealed to be Joseph's mother Elizabeth. [f] She fights with the Hamon by conducting it through her specially made scarf. Smokey Brown[g] is an ordinary petty thief hailing from New York whose newfound friendship with Joseph Joestar places him at the spectator's seat of the battle against the Pillar Men. Robert E. O. Speedwagon[h] is an ally of Joseph, and an old friend of the Joestars. Since the events of Phantom Blood, Speedwagon settled in America where he became an oil tycoon and founded the Speedwagon Foundation in order to deal with paranormal threats such as the Stone Mask and, later, the Pillar Men. Rudol von Stroheim[i] is the commander of the Nazi forces who discovered Santviento in Mexico. He is responsible for not only saving the life of Speedwagon, but also for trying to help Joseph defeat Santviento by blowing himself up. He returns later as a cyborg to assist in the fight against Kars and his army. Esidisi[j] is one of the Pillar Men. His Mode is the Heat Control Mode,[k] which allows him to make boil his blood to 500 °C (932 °F), which he injects into his foes to burn them alive by extending his needle-like blood vessels out of his own body. Wamuu[l] is one of the Pillar Men and Kars' loyal servant, following a warrior's code of honor. His Wind Mode[m] allows him to control the air in his lungs, turning it into a powerful wind at his disposal, from using it like a razor sharp blade to rendering him invisible. Kars[n] is the main antagonist who is the leader of the Pillar Men and the creator of the Stone Masks. He developed a Light Mode,[o] which allows him to produce saw-bladed appendages from his body which produce a radiant glow. He is intelligent and ruthless, and single minded in his dedication to become the Ultimate Being. [p] Though Kars succeeds, his obsession of killing Joseph lead to his defeat as he ends up being knocked out of Earth's orbit and frozen in space. The original volumization and Shueisha's 2002 re-release use different chapter titles. The Birth of a Superbeing!! Ōtarō Maijō's 2012 novel Jorge Joestar, follows the titular character, the father of Joseph Joestar, and his story as a child in the Canary Islands and pilot in the Royal Air Force, as well as an alternate version who lives in Japan and is investigating strange events regarding alternate dimensions. The arc was adapted as part of the first season of David Production's anime television adaptation, airing between December 7, 2012 and April 5, 2013. Warner Bros. Entertainment released this series in English on July 28, 2015. The young Joseph of this series appears as a playable character, alongside his older self, in Capcom's 1998 arcade fighting game, JoJo's Bizarre Adventure. Joseph, Caesar, Wamuu, Esidisi and Kars appear as playable characters in Bandai Namco Games' 2013 fighting game, JoJo's Bizarre Adventure: All-Star Battle, with Lisa Lisa later appearing as a downloadable character. Joseph, Caesar, Stroheim, Lisa Lisa, Wamuu, Esidisi, and Kars also appear in JoJo's Bizarre Adventure: Eyes of Heaven, also by Bandai Namco. ^ a b c d e f g Chapters 38–44 are part of Phantom Blood. ^ Chapter 114 is part of Stardust Crusaders. ^ "Read a Free Preview of JoJo's Bizarre Adventure: Part 2--Battle Tendency, Vol. 1". Viz Media. Retrieved 2018-06-02. ^ "週刊少年ジャンプ　1987/11/02　表示号数47" (in Japanese). Agency for Cultural Affairs. Retrieved 2018-06-17. ^ "週刊少年ジャンプ　1989/03/27　表示号数15" (in Japanese). Agency for Cultural Affairs. Retrieved 2018-06-17. ^ "コミックナタリー - 「ジョジョ」カラーページを完全再現した「JoJonium」刊行". Natalie.mu. 2013-09-19. Archived from the original on 2016-04-14. Retrieved 2016-08-22. ^ "JoJo's Bizarre Adventures: Battle Tendency Gets Print Edition in Fall 2015". Anime News Network. 2014-07-08. Archived from the original on 2014-07-12. Retrieved 2016-08-22. ^ "ジョジョの奇妙な冒険／5" (in Japanese). Shueisha. Archived from the original on 2004-09-03. Retrieved 2008-08-08. ^ "JoJo's Bizarre Adventure Volume 6". Shueisha. Archived from the original on 2012-09-14. Retrieved 2009-01-24. ^ "JoJo's Bizarre Adventure Volume 7". Shueisha. Archived from the original on 2012-09-14. Retrieved 2009-01-24. ^ "JoJo's Bizarre Adventure Volume 8". Shueisha. Archived from the original on 2012-09-14. Retrieved 2009-01-24. ^ "JoJo's Bizarre Adventure Volume 9". Shueisha. Archived from the original on 2012-09-14. Retrieved 2009-01-24. ^ "JoJo's Bizarre Adventure Volume 10". Shueisha. Archived from the original on 2012-09-14. Retrieved 2009-01-24. ^ "JoJo's Bizarre Adventure Volume 11". Shueisha. Archived from the original on 2012-09-14. Retrieved 2009-01-24. ^ "JoJo's Bizarre Adventure Volume 12". Shueisha. Archived from the original on 2012-09-15. Retrieved 2009-01-24. ^ "JoJo's Bizarre Adventure Battle Tendency 1". Shueisha. Archived from the original on 2007-05-09. Retrieved 2014-04-05. ^ "JoJo's Bizarre Adventure Battle Tendency 2". Shueisha. Archived from the original on 2007-05-09. Retrieved 2014-04-05. ^ "JoJo's Bizarre Adventure Battle Tendency 3". Shueisha. Archived from the original on 2004-08-03. Retrieved 2014-04-05. ^ "JoJo's Bizarre Adventure Battle Tendency 4". Shueisha. Archived from the original on 2007-05-09. Retrieved 2014-04-05. ^ "ジョジョの奇妙な冒険　第2部　戦闘潮流　総集編・上" (in Japanese). Shueisha. Archived from the original on 2018-02-09. Retrieved 2018-02-08. ^ "ジョジョの奇妙な冒険　第2部　戦闘潮流　総集編・下" (in Japanese). Shueisha. Archived from the original on 2018-02-09. Retrieved 2018-02-08. ^ "ジョジョの奇妙な冒険　［函装版］ JOJONIUM　4" (in Japanese). Shueisha. Retrieved 2018-01-27. ^ Ressler, Karen (2015-11-03). "North American Anime, Manga Releases, November 1–7". Anime News Network. Retrieved 2018-12-15. ^ "ジョジョの奇妙な冒険　［函装版］ JOJONIUM　5" (in Japanese). Shueisha. Retrieved 2018-01-27. ^ Ressler, Karen (2016-02-02). "North American Anime, Manga Releases, January 31-February 6". Anime News Network. Retrieved 2018-12-15. 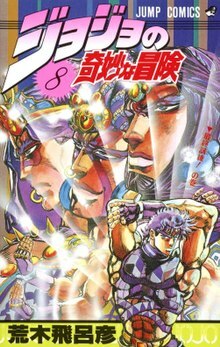 ^ "ジョジョの奇妙な冒険　［函装版］ JOJONIUM　6" (in Japanese). Shueisha. Retrieved 2018-01-27. ^ Ressler, Karen (2016-05-03). "North American Anime, Manga Releases, May 1–7". Anime News Network. Retrieved 2018-12-15. ^ "ジョジョの奇妙な冒険　［函装版］ JOJONIUM　7" (in Japanese). Shueisha. Retrieved 2018-01-27. ^ Ressler, Karen (2016-08-02). "North American Anime, Manga Releases, July 31-August 6". Anime News Network. Retrieved 2018-12-15. ^ "JORGE JOESTAR". Amazon.co.jp (in Japanese). Retrieved 2012-12-26. ^ Pineda, Rafael Antonio (2015-06-10). "Anime Expo to Premiere English JoJo's Bizarre Adventure Dub With Director Naokatsu Tsuda". Anime News Network. Retrieved 2015-07-04.